This home made version, on the other hand, is going to have less unpronounceable words than the bagged variety (sodium stearoyl-2-lactylate or calcium propionate, anyone?). And it’s as close to Punkin’s favoured sliced bread as we will get… we hope. The only thing it will be missing, I expect, is the new-fangled metallic looking plastic bag and the ubiquitous pre-slicing. With luck, this will be an interesting enough loaf with some amount of distinction that will at the very least have been baked with care and not pumped out of a factory. Let’s get bread #40 of the BBA Challenge on the road, shall we? 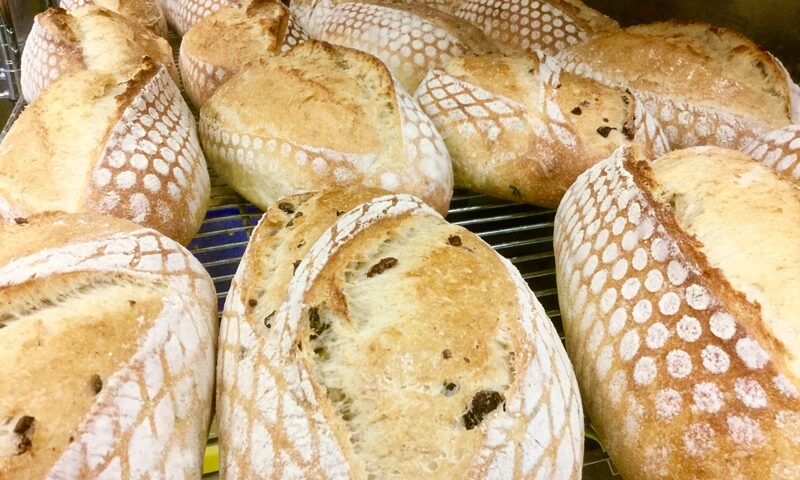 For this bread (I chose version #1 of the three versions in The Bread Baker’s Assistant simply because it uses milk powder, which I happen to have), there’s no preferment, no long, cool retardation to draw out the flavours. These, we are told by Mr Reinhart, come from the enrichments: an egg, some melted butter and a bit of sugar. So it’s a fast bread, as these go, being a basic yeast bread. Total time start to finish should be about 4 to 4½ hours. The recipe yield two 600g or so panned loaves. We can jump right to the Mis at this point. This is a simple, enriched bread. Clockwise we have: bread flour, sugar, water, one egg, yeast, salt, whole milk powder (not skim milk) and melted butter (ok , margarine). 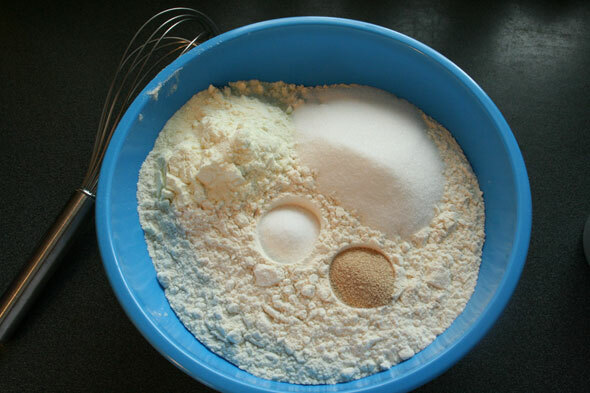 Variation #2 uses buttermilk instead of the milk powder. Variation #3 uses a preferment. 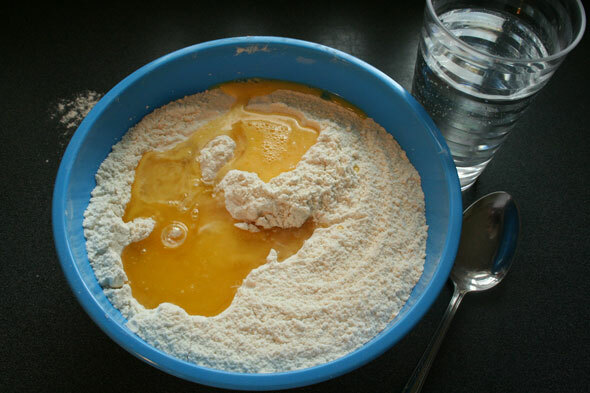 As usual, we mix the dry ingredients, them add the liquids then stir until the dough forms a ball. I used the suggested minimum quantity of water (364g) holding back about 3 tablespoons. 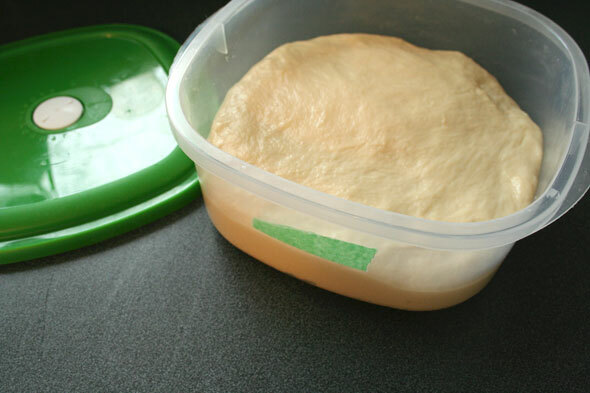 Surprisingly, this was plenty – if not more than – enough water to make the dough quite wet. For every recipe where Reinhart has recommend a minimum and maximum amount of liquid, I’ve always found the max amount was what my flour required to reach whatever desired tackiness was expected; I’ve assumed my flour was simply more absorbent than the one Reinhart used.. Here, I could have used even less. 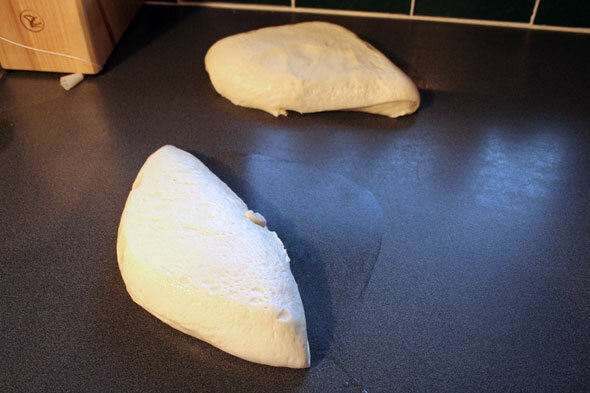 Once all flour has been hydrated, I turned the rather wet dough onto the counter and began giving it a fair bit of “stretch and fold” to try to get it to come together. The recipe wants it “tacky, not sticky” and it was definitely needing work to get it there. It was very much like the dough in Richard Bertinet’s folding video. 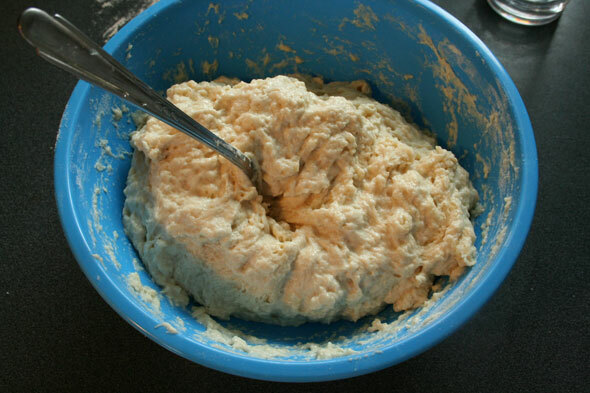 The recipe calls for 4-6 minutes of kneading but at that time point, the dough was still very sloppy and sticky, nowhere near “tacky”. 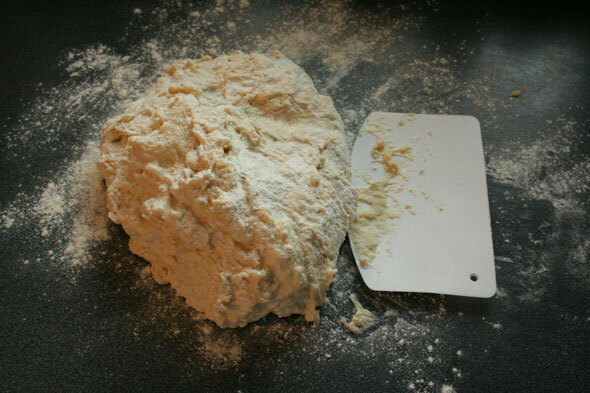 I ended up gradually adding about 1/2 cup more flour to get it to the tacky stage and a little over 12 minutes of stretching/kneading to make it handle-able. At that point it windowpaned well and was close enough to 80ºF. 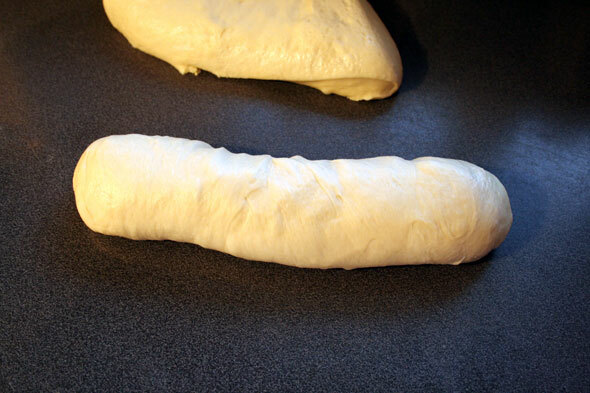 Sorry I don’t have pics of the transformation, I was a little focused on the dough here. Into the bulk proofing bowl it went and, 2 hours later, it had reached double its size. At this point is seems the outdoor light is vanishing, sorry about the poor colour on the next few pics. 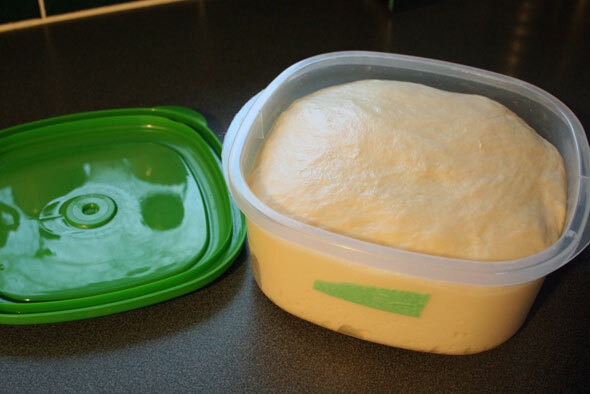 I turned the proofed dough onto a bare countertop and cut the (precisely 1200g) dough in two. Roughly. 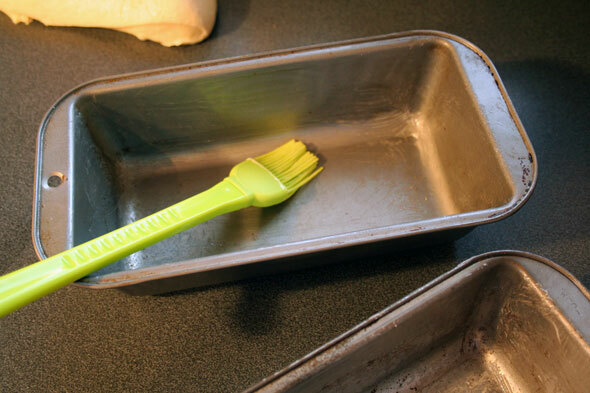 I greased two 8½” by 4½” (21.5 x 11.5 cm) bread pans. I took one of the dough pices and shaped it into a rectangle. I flattened it out but didn’t completely degas the dough. 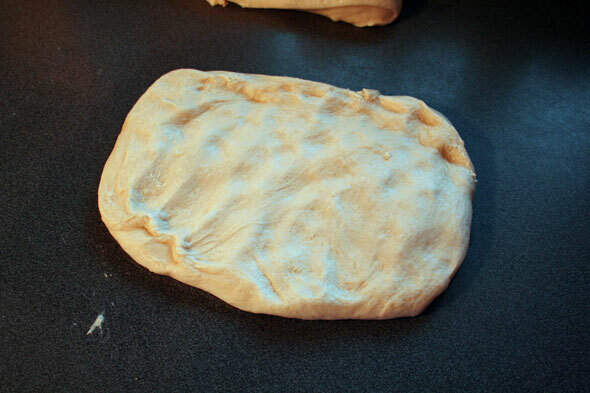 The rectangle is rolled into a log, making sure that some tension is created in the surface; the dough may be getting panned but the top crust still needs a little strength. The log is then flipped over and the bottom seam is pinched closed. 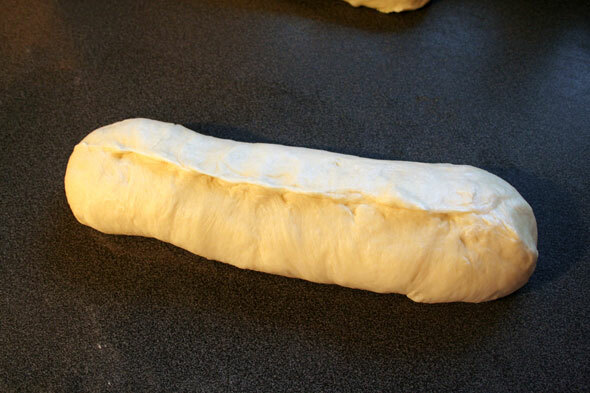 The dough is then placed into the greased pans seam side down and covered. 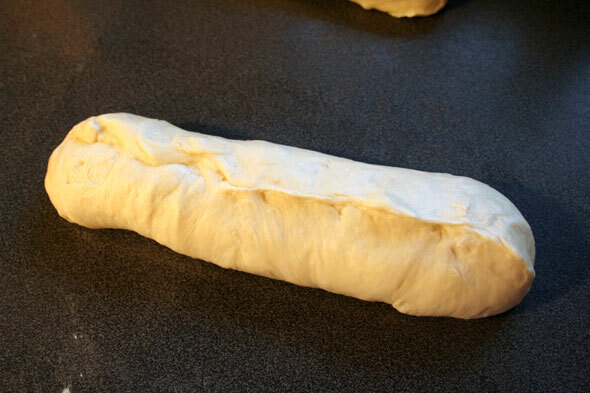 They are left to do the final proof for 60-90 minutes or until nearly doubled in size. 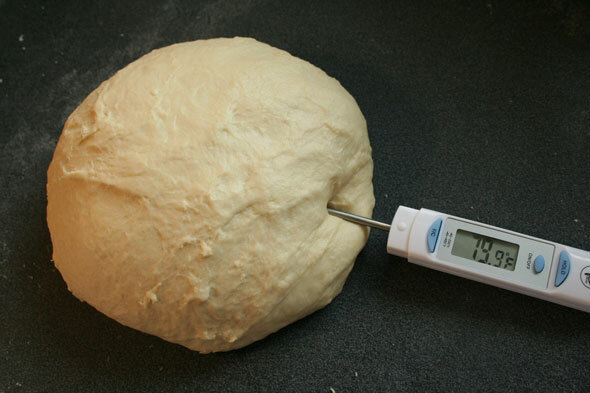 While the loaves were proofing, the oven was preheated to 350ºF (400º if these had been made into rolls or buns). After 90 minutes, the loaves had not proofed up quite enough and a “poke test” had the indentation filling back in rather quickly so they got an extra 45 minutes. Hmmm… and the kitchen is about 73ºF right now so it’s not the temperature. I am suspecting the yeast, I have been thinking of late that it’s really not performing as well as it should. Fortunately, I’m down to the last teaspoon so it’s time to get more anyway. Hopefully, we’ll see plenty of oven spring. 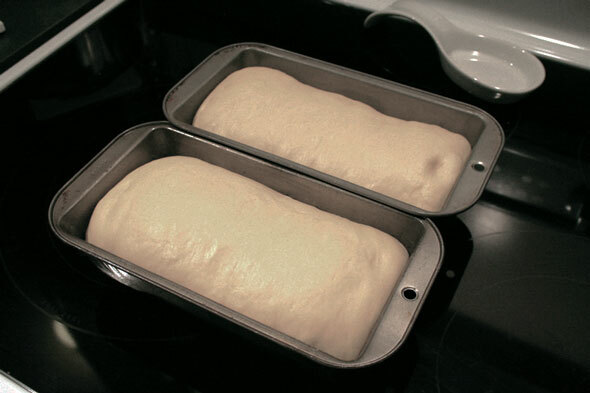 Once proofed and ready, they were baked for 35-45 minutes with a 180º rotation halfway through for even baking. The desired internal temp is 190ºF. 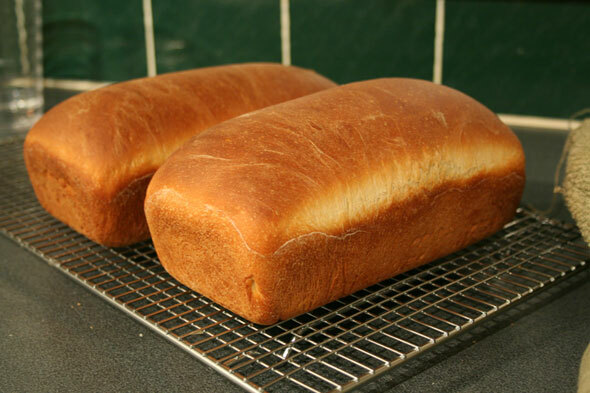 The finished bread is removed from the pan immediately and cooled on a rack for 1 hour (15 min. for rolls). Well, they did get some oven spring, but not a lot. I’m again suspecting the yeast is at fault. An hour (or so) later, I can finally cut into it and check the crumb, get the final Crumb Shot and give it a taste. Yup, this is plain white bread. A tastier version than the store bought stuff, undeniably. Thin, light crust, and once bagged will surely be soft as expected. The crumb is a little denser than regular store bought so it has a bit more presence, although this may be to a large degree due to what I suspect is not enough rise. Fuller would have probably meant fluffier. Untoasted, this bread is unremarkable, understated which is exactly what some folks want from their bread: an unobtrusive backdrop or edible plate for tuna salads and such. Would not interfere with peanut butter and jam in any way even though it does have a little more flavour. Toasting would seem imperative if you wanted to actually enjoy this bread’s flavour. A great bread? No, just good. I’m afraid that, looking at the bigger picture, the time and energy needed to make this slightly improved bread is not going to balance out the equally acceptable and readily available bagged version. That is just too easily available with little more fuss than which brand of bailed fog one wants to put in the shopping cart. And in all honestly, that’s the intent of bagged sliced white bread, isn’t it? To serve as a foil for other stuff. The “behind the scenes” dude that lets the star shine. If I had kids that went through several loaves a week, I might certainly go through the effort and make several loaves in one go and likely even start to save a bit of coin in the process. So we’ll put this in the “nice and maybe whip one up now and again for interest” column. I think if I’m going to put time into bread, it will need to have a little more “wow”. So in the end, I have no objections to this, it’s actually quite nice, plain bread. It just isn’t going to knock the factory version out of the ballpark for our household. And I really have to find better yeast. SallyBR from Bewitching Kitchen who picked variation #2 and found her rolls delicious. Phyl Of Cabbages and King Cakes liked var #1 well enough that he then made var #3 with a Dutch Crunch for fun. Anne Marie over at Rosemary & Garlic made all three variations: #1 was the winner. Well, according to the official recipe list, Whole Wheat Bread. However, the three people who have made this one and blogged it so far have all been greatly underwhelmed. Even someone’s dog didn’t like it. So I’m figuring we’ll just hop over that one and jump right to the much more interesting Potato, Cheddar and Chives bread. Besides, we already did the Light Whole Wheat Sandwich Bread near the beginning of the book which was very nice so if I want a good WW bread, I will gladly hit that one again. I hope to get here soon! I do crave squished peanut butter sandwiches on white bread! But I agree the bread recipes with more Wow are the fun ones!! Happy Baking! I made this bread twice. Not because it was so great, but because I wanted to try version 3 after making version 1, and I got the idea to try it with Dutch crumb the second time. It was much better; but still not an out of the ballpark bread. I made all three of them, have a husband who likes white bread. It is white bread, just what you expected. .-= Anne Marie´s last blog .. Mezze, The Daring Cooks Challenge =-. Cool! You can compare between the three types! Did you find one stood out from the other? Any noticeable difference in the final outcome? How sad to have white bread so close to the end of our challenge! PR should have called it Basic white bread and moved it up to the B’s so we could get it out of the way at the beginning. As ususal, I always learrn something new from your posts (or rather remember something I knew but had completely forgotten!) I am referring to the poke test. Thanks for the reminder. .-= Cindy´s last blog ..#30. 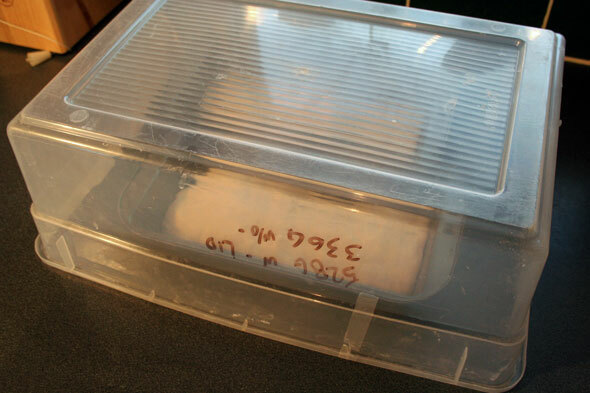 Basic Sourdough Bread – My Bread Bat Mitzvah =-. I made version 3 using lowfat buttermilk. It is outstanding. 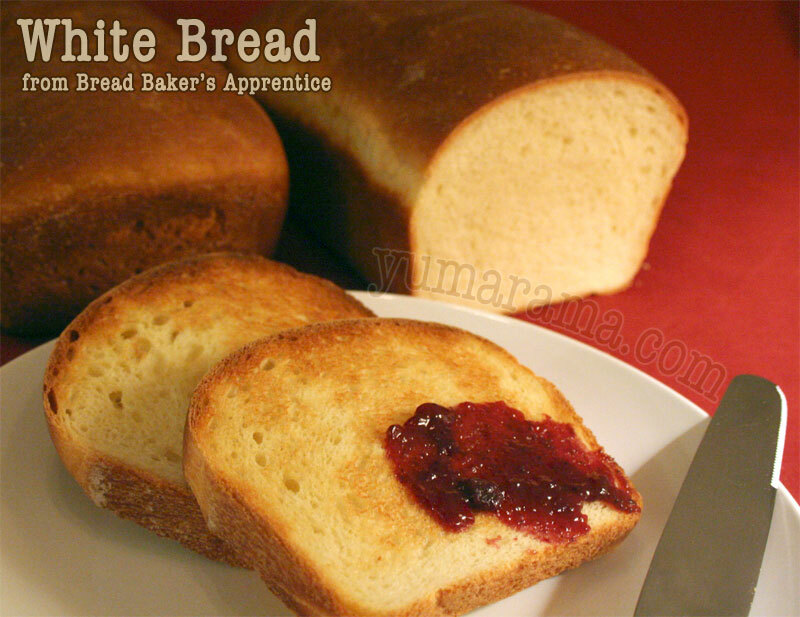 Tastiest white bread yet. Your bread looks awesome! How do you manage to get the dough raise evenly? I will try out your recipe this weekend. I am going to adapt the recipe to my Pullman tin. Due to the budget constraint, I didn’t buy the non stick version Pullman tin. Guess what after I bought the tin, I found most of the dough won’t stick to the aluminium pan. 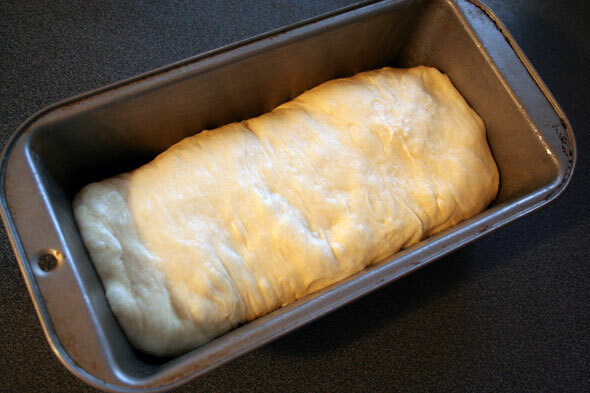 After come out from oven, just give the tin light shake, the loaf will drop off effortlessly. Here is my pan.